Help Faye save her memories and family from the Fairy Queen of Dreams! Travel across multiple worlds full of magic and intrigue as you attempt to find Faye`s husband and daughter! 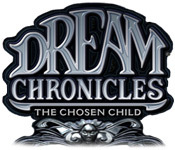 Dream Chronicles: The Chosen Child is an exciting Hidden Object Adventure game full of suspense and fun. Can you interpret the mysterious dreams that Faye has been having and figure out where her daughter fits in this tale?